Join us on an adventure. Experience Defiance in Phlan. Win giveaways from Dragon's Lair. 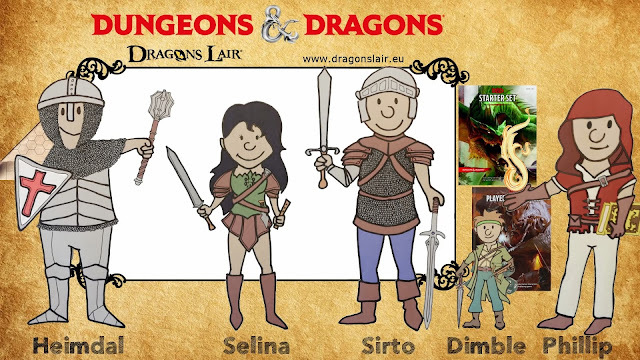 Learn to play rolegames. Those are the words for the trailer for the new danish D&Danmark youtube series. I was asked to help set it and be the DM for the game. In January, we recorded and the series officially started on saturday 25th February 2017. I decided to run Defiance in Phlan because it's a good introductory adventure that many viewers may be able to relate to. We divided the five missions so that each player could upload a number of episodes to their youtube channels. Each mission was then divided up into 15-20 min segments to create episodes that would run until June 2017. The five youtubers we've gathered are TreGangeRød, PinkPulse, MekanikerenDK, Tankeskud, and MikeTheNumbers.